In this volume, an internationally renowned historian of Christian doctrine offers a theological reading of Acts. Now in paper. New series volumes will continue to release in cloth, but as older volumes reprint, they will release in paper. 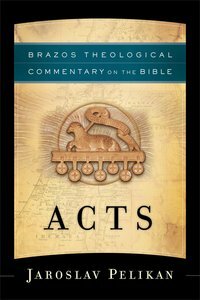 About "Acts (Brazos Theological Commentary On The Bible Series)"
JAROSLAV PELIKAN is Sterling Professor of History Emeritus at Yale University and in 2004 received the John W. Kluge Prize for Lifetime Achievement in the Human Sciences. During his distinguished career he has received dozens of honors and awards, including 42 honorary degrees. He is the author of nearly 40 books and the editor of scores of others.